Greenbushes is a timber and mining town located in the South West region of Western Australia. The 2016 population was 362. Greenbushes was founded as a mining town in 1888 following a surveyor's discovery of tin in 1886. Greenbushes was named after the bright green bushes that contrasted against the grey eucalyptus trees. The railway from Donnybrook to Bridgetown opened in 1898, with Greenbushes station located approximately six kilometres north of the main townsite. The area surrounding the train station was renamed North Greenbushes to reduce confusion. The town experienced a period of economic boom until the international price of tin slumped in 1893, which caused the Greenbushes industry to collapse. By 1913, approximately one quarter of Greenbushes' inhabitants were working in the timber industry, which was established shortly after the first mine. The Greenbushes mine, located to the south of the town, has produced lithium concentrate since 1985. ^ a b Australian Bureau of Statistics (27 June 2017). "Greenbushes (L) (Urban Centre/Locality)". 2016 Census QuickStats. Retrieved 27 May 2018. ^ a b c "Travel: Greenbushes". The Sydney Morning Herald. 8 February 2004. Retrieved 2008-01-15. 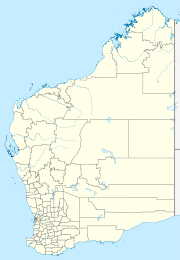 ^ a b c Western Australian Land Information Authority. "History of country town names – G". Retrieved 2008-01-15. ^ a b "Shire of Bridgetown-Greenbushes: Business and Industry". Archived from the original on 2013-05-14. Retrieved 2008-01-15. This page was last edited on 3 November 2018, at 07:20 (UTC).